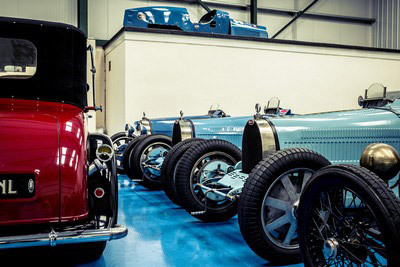 For obvious reasons and peace of mind, security is a high priority and very important to all owners of cherished vehicles - especially those fortunate enough to have vintage Bugattis. Wornal Business Park is a high-security site with, amongst other things, strategically placed and discreetly hidden surveillance cameras. Gentry Restorations also has a comprehensive security system to cover all areas within its premises. For example, numerous door and movement detector sensors. If any of these are triggered for any reason, this activates external and internal alarm sirens and more importantly, the local police force is notified. Following major restoration work, or sometimes simple repairs and servicing, many owners ask for their vehicles to be stored at the company's premises for either short or long-term periods. Gentry Restorations has accommodated this, utilising its own, dedicated storage area. However, the facility isn't restricted to vintage cars only - any marque, any car and even motorbikes, no matter how old they are, can be catered for. Below are the four most popular options that Gentry Restorations makes available as part of the company's 'standard' services. However, in reality the company can tailor any package to suit an individual owner's specific requirements. For all storage enquiries, feel free to contact the Gentry team for sound and professional advice. The vehicle is protected under an individual cotton cover and kept in a highly-secure, windowless, insulated unit, that enjoys minimal temperature fluctuations throughout the year. The battery is either disconnected or removed by the owner. Please be advised that this level is more suited for longer-term storage, when the vehicle is expected to be immobile for long periods of time and will need to be re-commissioned before being driven again. The vehicle is protected under an inividual cotton cover and kept in a highly-secure, windowless, insulated unit that enjoys minimal temperature fluctuations throughout the year. The battery is connected to a battery conditioner. Please be advised that this level is more suited for owners who like to drive their vehicles periodically. It should be noted however, that at this level, the owner is advised and expected to check all fluid levels and tyres etc before leaving the facility. The vehicle is protected under an individual cotton cover and kept in a highly-secure, windowless, insulated unit, that enjoys minimal temperature fluctuations throughout the year. The battery is connected to a battery conditioner. The vehicle is inspected monthly for fluid leaks, the engine started once-a-month and run-up to operational temperature. In addition, all ancillary functions are checked, wheels turned and tyre pressures checked. Please be advised that this level is ideal for both long-term storage as well as for those owners who like to drive their vehicles regularly. Obviously, owners who choose this level of storage will not have to check fluid levels and tryes before leaving the facility. The vehicle is protected under an individual cotton cover and kept in a highly-secure, windowless, insulated unit, that enjoys minimal temperature fluctuations throughout the year. The battery is connected to a battery conditioner. The vehicle is inspected weekly for fluid leaks. The engine is started once-a-month and run-up to operational temperature. It is then driven on dry roads for a minimum of 10 miles. During winter months, especially if the roads are wet or covered in ice/snow, the vehicle will be put through its paces on the company's rolling road at no extra charge. All mechanical and ancillary functions are checked, gauge readings noted and a monthly report emailed to the owner. Please be advised that this level is ideal for both long-term storage as well as for those owners who like to drive their vehicles regularly. Obviously, owners who choose this level of service will not have to check anything on their vehicle before leaving the facility. Air-Bubble Type Shelters - unlike many competitors offering vehicle storage, the facility at Gentry Restorations is windowless, sound, dry and closed to the elements. In addition, it is insulated and therefore enjoys minimal temperature fluctuations throughout the year. As a consequence, the company does not believe there is a need to use individual air-bubble type shelters for vehicles within its storage area. However, if an owner insists on using one, this can be catered for. These shelters can be purchased outright in advance or, built into the monthly storage charge. Please note that prices vary depending upon the size and quality required - Guide price for year one, approximately an additional £50.00 + VAT per month. Subsequent years an additional £20.00 + VAT per month, until a replacement shelter is considered necessary. Access to and Use of Vehicles - the normal hours of operation are Monday to Friday from 08.00hrs to 17.00hrs. If an owner requires access to the storage facility outside of these hours, a minimum of 48 hours advanced notice is all that's required. Provided this notice period is given, no charge will be made for this element of the service. Payment Terms for Storage - 3 months in advance with a full refund for any broken period. Payment for Additional Services - depending upon the requirements, some services will require payment in advance. Some of the services might necessitate stage payments and others can be paid for upon the completion of the work specified or undertaken. All quotations will clarify this before the commencement of any work. Insurance and Security - vehicles are stored in a windowless, fully-alarmed building and the site is totally fenced and gated. The site's entrance is constantly monitored by surveillance cameras. If our building's DualCom (landline and mobile communication system) alarm is triggered, the system notifies the management team - all of which live within 10 minutes of the site - as well as the local police. Tight security is one thing but insurance is another. When placing your vehicle into either long or short-term storage, you should retain your own insurance and inform your insurer that it's going to be stored. You must ensure that, whilst your vehicle is in storage, it and its contents are insured for fire, theft and accidental damage. Please note - most insurers offer reduced premiums for 'laid-up' or 'storage-only' cover. Furthermore, if a vehicle has an extraordinary value or any special conditions for it to be insured, then it is imperative that you let us know. If required, we will try to arrange insurance cover at the best rates available - subject to a completed proposal being accepted. Warning - as with all insurance policies, the devil is in the detail. You must not assume that your current policy (or even a motor trader's policy) covers your vehicle for storage on remote premises, or for transportation purposes. It is essential that you notify your insurance provider that you intend to store your vehicle, or have it transported, by a specialist company. This advice isn't given to protect us, it is appropriate because many companies offering such services, won't necessarily have the levels of insurance in place to cover your vehicle. For all storage requirements and enquiries, feel free to contact the Gentry team for sound and professional advice.